I left Wall Street unexpectedly following an appearance on the Phil Donahue Show in 1985. There, on the Oprah Winfrey Show of its day, Richard Yao and I discussed "religious addiction" - the first time that phrase had ever been mentioned on national television. I explained to Phil the need for an "anonymous" organization to help those recovering from religious addiction, including followers of powerful TV evangelists such as Jerry Falwell, Pat Robertson, and Jimmy Swaggart - then riding high, broadcasting seven days a week, and raking in millions. 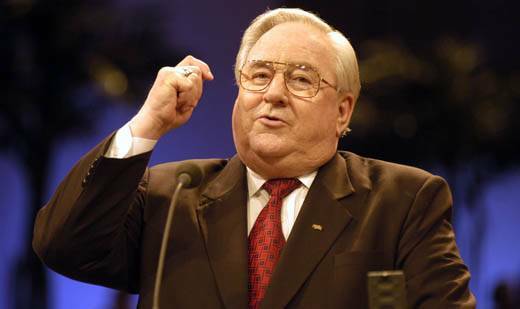 Jerry Falwell, head of the Moral Majority, died in 2007. The response was so overwhelming -- with 17,000 people asking for help -- that I had to choose between responding to those I had said, "If you're hurting, call us!" and my Japanese banking career. One woman who soon called us told us an unbelievable story, which turned out to be typical. She was financially unable to give, but was led to believe it was "God's Will" that she keep giving to a TV evangelist. Other stories - thousands of them -- were of emotional, sexual, and physical abuse. These personal stories were so strong they were written-up, in article after article, by the Associated Press], Christian Science Monitor, Los Angeles Times, Newsweek, Philadelphia Inquirer, San Francisco Chronicle, USA Today, Washington Post - even the London Observer and Toronto Star. Never a Fundamentalist myself, I co-founded Fundamentalists Anonymous and -- with the help of Hank Luce and the Henry Luce Foundation -- raised $1.2 million from 1985 to 1989 to build support groups across the U.S. for recovering fundamentalists. Hank was Presbyterian and I, Episcopalian. Recovering Fundamentalists, like members of my own family, are those who believed themselves to have been so damaged by their all-or-nothing lifestyle most could not even walk into a Mainline church without feeling nauseas. The momentum we gain was startling. Richard and I testified in Congress against the TV evangelists in 1988. During this period I served as resource and was interviewed repeatedly by the New York Times, Wall Street Journal, Today Show, in addition to CNN, A.P. & U.P.I. One reason for our enormous coverage was the media's fear of the Religious Right. The Moral Majority, headed by Falwell, consisted of conservative Christian political action committees with membership in the millions. Jerry Falwell attacked our Fundamentalists Anonymous along with the A.C.L.U. and Norman Lear's People for the American Way in his endless direct mail appeals. 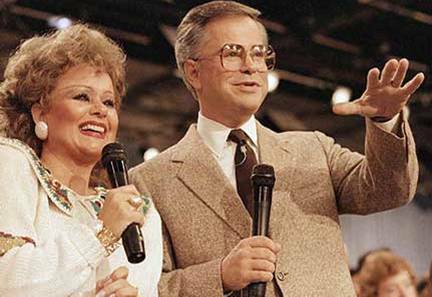 ''This is terribly upsetting,'' said Ginger Harney, a 76-year-old California woman, who was sending money to the TV evangelists Jim and Tammy Bakker until the scandal involving charges of adultery, hush money and drug abuse erupted. She is one of thousands of fundamentalists throughout the country who are overwhelming the tiny staff of Fundamentalists Anonymous, or F.A., in New York, with telephone calls and letters. The group operates from an unfinished church basement in Manhattan, wishing to keep the exact location secret because of threats. The complaints by fundamentalists are ranging from simple disillusionment with most TV evangelists to callers claiming that fundamentalism has caused them bankruptcy, divorce, and suicidal depression. One caller said her husband chained her in the basement for three months trying to get the devil out of her. Those calling the hot line receive a newsletter and referral to one of 41 chapters across the country serving the group's 30,000 members. The group's budget could reach $300,000 at the end of the current fiscal year, said Mr. Yao, who points proudly to the Rev. Jerry Falwell's attacks on F.A. as proof it is having an effect. ''If the fundamentalist experience is working for you, fine, but we're here if it isn't,'' said Mr. Yao , who quit his job with the Wall Street law firm of Mudge Rose two years ago to begin the group with Jim Luce, 27, a former assistant Eurobond portfolio manager with Daiwa Bank. The Washington Post covered us. A story entitled "Healing After the Leap From Faith: Fundamentalists Anonymous Aids Those Who Cast Off Religion" ran in 1987.
with Marty Scorsese' controversial film, Last Temptation of Christ (1988). I spoke out about the dangers of the Fundamentalist Mindset every chance I got, from attacking Pepsi's Boycott of Madonna because of her "Like a Prayer" video to supporting Universal Studio's and Marty Scorsese' film, Last Temptation of Christ. 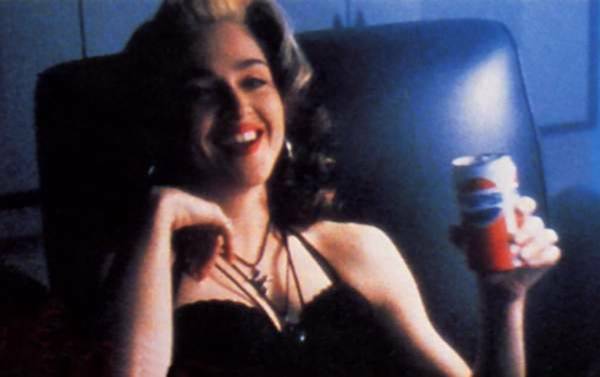 Pepsi dropped Madonna as a result of a Fundamentalist boycott (1989). I did not limit myself to Christianity. The Fundamentalist Mindset is one of black-and-white that any faith can fall prey to. So I criticized poor Salman Rushdie for not being strong enough, calling him "Spineless" in 1991 in the Los Angeles Times. He caved to Islamic extremists and agreed not to publish his Satanic Verses in paperback. As a young twenty-something, I felt he was a coward. "This spineless and shameless capitulation is a serious setback for free speech. It will only encourage more fundamentalist attempts, whether Christian or Islamic, to censor literature and art," I told the LA Times. Our biggest accomplishment was standing up for those torn down by the TV evangelists. I coordinated our legal task force, announced in a 1987 press conference. "The PTL scandal emphasizes the complete lack of accountability in many fundamentalist or pentecostal groups," I was quoted as having said. The PTL Club collapsed in 1987. Tammy died in 2007. The Task Force had three major goals: 1) accountability of religious leaders to their followers, 2) deterrence of future acts of abuse or misconduct, and 3) protection and expansion of the legal rights of religious consumers. One of my best efforts was a poster of Jim and Tammy Bakker behind bars for a benefit for the Legal Task Force with Steve Allen and Frank Zappa. The problem was it was so good people pulled them down to decorate their dorm rooms. Interfaith dialogue was also important to me. 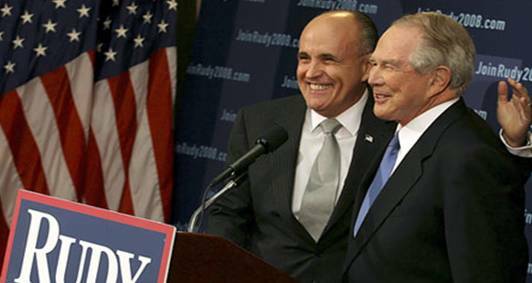 I spoke frequently with Jewish leaders including Rabbi Jim Rudin. A search on-line revealed the Archives of the American Jewish Committee. On Monday, December 16, 1985, I met with Rabbis Gunther Hirshberg and A. James Rudin. According to the Archives, Mimi Alperin introduced us. "Fundamentalists Anonymous began in April, 1985 with a two-line ad in the Village Voice. The organization has since mushroomed and has attracted over 20,000 ex-fundamentalists as well as considerable media attention. "Following appearances on the Donahue Show, the Today Show and mention in several major news magazines, Yao and Luce left their professional Wall Street jobs to build their organization. "Luce stressed that fundamentalism is characterized by an authoritarian "mindset," which is incompatible with a positive appreciation of religious pluralism. "In addition to providing counseling for ex-fundamentalists, they attempt to educate the public about the social and political implications of fundamentalism. "In the discussion which followed, several IAC members inquired about fundamentalist Jews. "Yao and Luce pointed out that 10-15% of the total response has been from Jews leaving fundamentalist groups," the A.J.C. Archives conclude. We could not have claimed Fundamentalism was addictive and psychologically dangerous if we did not have the support of the mental health community. After the Donahue Show, we heard from dozens of therapists -- psychologists and psychiatrists - who were dealing in their own practices with the trauma we were discussing. We served as a catalyst for them to come together. We were soon able to arrange for the American Psychological Association to have a panel on religious addiction for the first time at their annual convention in New York, 1987. The Journal of Religion and Health carried an article based on that panel entitled "Fundamentalist Religion and its Effect on Mental Health" written by two psychiatrists, on from the Veteran's Administration in Los Angeles, and the other in private practice in Boston. The journal article stated, "The national self-help group Fundamentalists Anonymous has focused attention upon mental problems that may be caused or exacerbated by authoritarian religion. "In this article we outline assertions about the mental problems caused by membership in fundamentalist religion, illustrate these with two case histories, briefly discuss intervention strategies, and describe conceptual and empirical issues. "While former members have presented problems severe enough to warrant professional treatment, a causal link between their symptoms and their religious membership has not yet been established, because there is little empirical work on the subject." This was cutting-edge science. Psychology Today then covered our efforts in a piece entitled "Leaving The Fold" (Jan. 1988). The publication that served as the foundation for Fundamentalists Anonymous was Richard's There is a Way Out, which I published through Luce Publications. I was 26. This booklet is still found in libraries throughout the U.S. I can only imagine what we would have accomplished had we had the Internet in the 1980's! M. Scott Peck endorsed us: "Fundamentalism, with its pervasive sense of guilt about most normal physical and emotional feelings, and its patriarchal structure wherein the father's word is law, creates family atmospheres where emotional, physical and/or sexual abuse of children is the rule, not the exception. "Such abuse is now being publicized thanks to organizations such as Fundamentalists Anonymous," Peck wrote in Road Less Traveled and Beyond. Other books, of many, are Culture Wars (James Davison Hunter), Co-Dependence (Charles L. Whitfield) and Hollywood Under Siege (Thomas R. Lindlof). 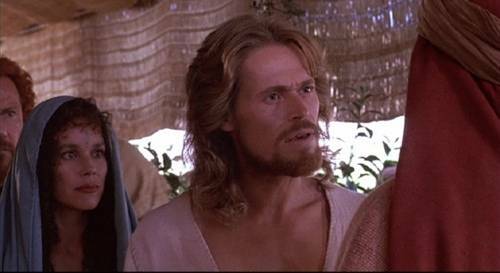 Hollywood Under Siege discusses how I was invited to support Universal Studio's Last temptation of Christ in New York. My friend, publicist Josh Baran, also invited Daniel Berrigan, Ram Dass, and ex-Jesuit Terry Sweeney. In extreme cases, Luce reports, women and children in violent fundamentalist families suffer further abuse while struggling to follow a religion that teaches them to stay in the home despite beatings. "We have members whose children have been maimed, who have been maimed themselves, because their religion teaches them to stay in a bad situation. They may even blame them, saying they are bad and that's why there is violence directed against them," he said. Problems can go unnoticed, Luce adds, if a family lives within a kind of Fundamentalist subculture where outside help is discouraged. FA's files are filled with case studies of former Fundamentalists who say religion became so powerful in their lives that they were unable to have relationships or make rational decisions. In the New York Times, Ari Goldman wrote "Evangelicals Flourish, with a New York Touch." On Sunday at Bethlehem Church in Richmond Hill, Queens, a full house of 600 worshipers sang spirited hymns, held hands in prayer and fell silent as a congregant was ''seized by the spirit'' and spoke in unintelligible speech known as tongues. The church is a member of the Assemblies of God, the same church that recently defrocked Mr. Bakker of the PTL ministry. The Bakker scandals have not shaken his congregation, said Mr. Behr, using the barometer of attendance and contributions, both of which have continued to increase in recent weeks. Another indication of Evangelical strength in New York is the pace in recent weeks at Fundamentalists Anonymous. 'We've never been busier,'' said Jim Luce, associate executive director of the organization that seeks to help those who feel trapped in the Evangelical wing known as Fundamentalism. According to Mr. Luce, Fundamentalists tend to see the world in absolutes and are likely to break off contact with those who do not agree with them. Since the PTL scandal broke in March, the number of letters and calls to Fundamentalists Anonymous has doubled to 150 a day, Mr. Luce said. Although the TV evangelists are long gone and forgotten, the evil that is the Fundamentalist Mindset is as alive today as ever. I am as committed today to counter it as I was in 1985. Tolerance must prevail if humanity is to survive. Note: Fundamentalists Antonymous existed in the days before Internet reporting. Slowly, newspapers and wire services are digitalizing and I will attempt to bring the stories on-line as they are available. Newsweek's "Is Fundamentalism Addictive?" (8/5/85), The New York Observer's "Fighting Authoritarian Mindset (2/1/88), and The New York Law Journal's "Lawyer Volunteers Aid Claims Against Cult Groups" (1/19/88). I will see that newspaper and magazine accounts that do not become available by the end of 2009 are PDF'd and posted on www.jimluce.com.